New investors in the Mangalarga Marchador breed, partner with Summerwind Marchadors to create new investment ideas and opportunities. Since that initial investment, a year later, they also bought their own Marchador – Fidalgo do Summerwind. Phyllis J. Ley – Born in San Francisco, has lived in California, Oregon, Washington, Montana and Arizona. She is a retired Registered Dental Hygienist with over 25 years culminating in Coronado, CA at Naval Amphibious Base. Phyllis loves the outdoors, landscape design, and collecting carousel horses. She’s been interested in horses and horse lover all her life, owning them in Washington and Montana before Arizona. In 2011, they moved to Arizona, bringing her Quarter Horse and two new Arabians. Her only horse now is 3 year-old Arabian Gelding training in Paulden, AZ with Ned Leigh. Her keen interest in Mangalarga Marchadors began when she saw a ground-training clinic for Marchadors at Ned Leigh’s Equine Focus in Paulden. Then when visiting Summerwind Marchadors, Inc in Pagosa Springs, CO she rode two of them – and really fell in love with these gentle, smooth-gaited horses! Now she is an Investor in Summerwind and wants to help ensure the breed has consistent, top-quality management while broadening her knowledge and understanding of the Mangalarga Marchador. Jack R. Shriber – Born in Ogden, Utah and has lived all over the U S and in Europe, having retired from the U S Air Force with 28 year’s service responsible for Telecommunications Management. He became interested in horses when he and Phyllis lived in Montana and they bought a Quarter Horse there. Having observed the Marchador horse at both Scottsdale and Pagosa Springs ranches, he is also now truly interested in furthering the best development of Mangalarga Marchador expansion and growth in the U S through supporting Summerwind in Scottsdale and Pagosa Springs. Jack and Phyllis join the family of Summerwind and Future Foal in setting a new direction and energy in Summerwind Marchadors. They are excited to be part of the Marchador playbook and history. 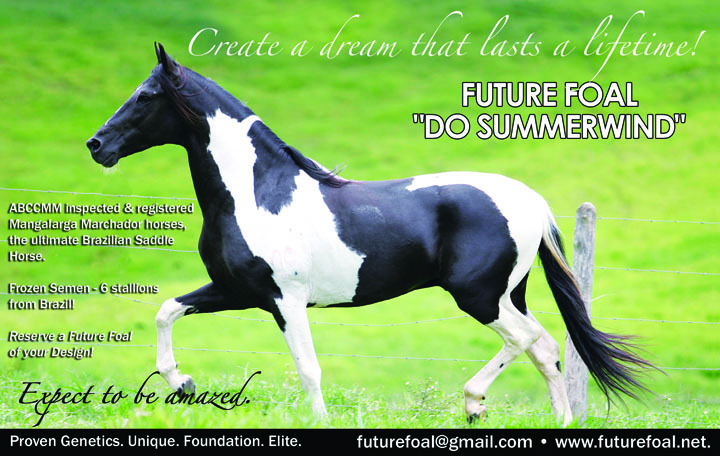 Contact us for more information about what you can do to launch this exciting new breed in North America. Previous PostSW Clinic Nov 27-28 Sign up!Next PostFidalgo do Summerwind – SOLD!